Why buy individually when you need bulk supplies? 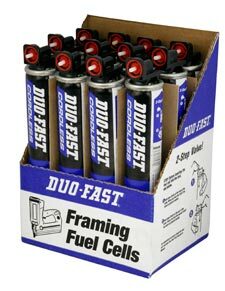 Duo-Fast agrees, and is now selling their cordless framing fuel cells in convenient 12-cell bulk packs. Now it is easy to head to the store and make just a single purchase instead of twelve. "The DUO-FAST fuel cells are based on proven ITW technology that has been around for 25 years," said Jacek Romanski, National Marketing Manager for DUO-FAST Construction. "We are providing contractors with the convenience of buying in bulk or one at a time if that's all they need." Even if you don't own a Duo-Fast nailer you can still take advantage of buying in bulk because these same fuel cells are compatible with most cordless framing nailers on the market today, including ones from Bostitch, Hitachi, and Paslode. Unfortunately it doesn't look like any savings will come from this bulk offering. A single cell costs $7.50, and the 12 pack costs $90 (7.50 x 12). Bummer.